Homemaker Bedding offers a range of quality home decorations for the bedroom and bathroom. The operate online, selling fantastic bedding sets and sheets, plus a selection of bathroom products. 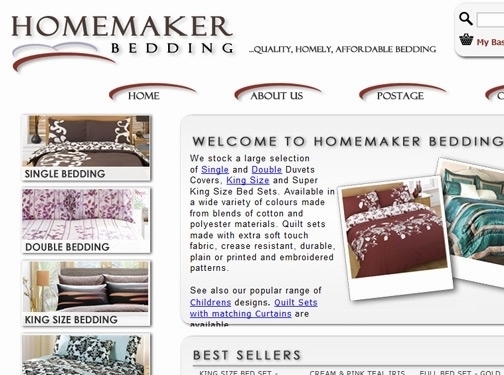 If you want to make the most of your bedroom and bathroom, you should take a look at the Homemaker Bedding site. Here you can find styles and colours to fit perfectly with your home and your taste. Have a browse and see what you think. UK based business - established over 5 years ago - providing bedding products and accessories for sale. Website includes e-commerce facilities, delivery and returns information, terms and conditions, contact email.